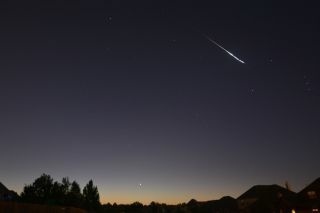 Cheryl Welch captured this Perseid meteor streaking over Broken Arrow, Oklahoma, on Aug. 13, 2014. Summertime sees the greatest abundance of meteor showers and the season's peak is in July. Each summer, amateurs all over the world look forward to observing August's famous Perseid meteors, but they often overlook no fewer than six showers that begin in July, with three reaching their maximum this month. In addition to meteors associated with showers, there are also sporadic ones, apparently unrelated to one another, that occur at an average rate of about seven per hour. The duration in days of a particular meteor shower is somewhat arbitrary, since the beginning and ending are gradual and indefinite. The number of meteors an observer can see in an hour depends strongly on sky conditions. The rates given here — taken, in part, from the 2015 Astronomical Calendar, which is edited by Guy Ottewell — are based on a limited star magnitude of 6.5 (a really dark sky), an experienced observer and the assumption that the radiant is directly overhead. The lower the radiant in the night sky, the fewer the meteors seen. At about 30 degrees up in the sky, the quoted hourly rate of a meteor shower is halved; at 15 degrees, it is reduced by two-thirds. Another factor is the phase of the moon, which this year will be full on July 31 and new on Aug. 14. Thus, this year is a good one for viewing the Perseids but not so good for seeing the showers that peak at the end of July or early August. First to appear are the Capricornids on about July 10. This shower peaks on Saturday (July 25) and ends on Aug. 15. Under the best conditions, only a few bright meteors per hour come from this stream, so you'll hardly know it is in progress unless you plot meteor trails on a star map and trace them back to their common intersection point; most of the meteors you'll see will be sporadic ones or members of another shower. The Capricornids' radiant reaches its highest point — about 30 degrees up in the southern sky — at about 2 a.m. local daylight time on July 25. The waxing gibbous moon will have set about an hour before then, leaving the rest of the night dark for prospective meteor watchers. The Delta Aquarid shower has a double radiant, indicating that we are seeing two distinct streams of celestial debris burning up in Earth's atmosphere. The meteors are mostly faint, with just 5 to 10 percent leaving persistent trails. These shooting stars move at slow or medium speeds because they are coming in sideways across Earth's orbit. On peak night this year, the double radiant will be highest — roughly 40 degrees above the southern horizon — at 3:30 a.m. local time. The bright gibbous moon will have set about 80 minutes earlier in the night, so there will be about 100 minutes of dark-sky time before dawn breaks. The final shower reaching maximum this month is the Piscis Australid, which lasts from July 10 through Aug. 10 and peaks on July 30. This is a lesser stream; only about eight meteors per hour are seen under the best conditions to observers in the Southern Hemisphere, where the radiant — near the bright star Fomalhaut — climbs high in the sky. The nearly full moon will wreck any chances of getting a decent view this year, unfortunately. Another weak shower is the Alpha Capricornids,which begin about July 3, peak on Aug. 2 and end on Aug. 15. The radiant reaches its highest point (about 30 degrees high in the southern sky) about 1 a.m. local time. Though they produce only about five meteors per hour, the Alpha Capricornids are photogenic, frequently producing bright-yellow fireballs that can be quite spectacular. Sadly, the bright moon, 95 percent illuminated, is not too far away in nearby Aquarius and will seriously impact the peak of this year's display. The last minor shower before the Perseids is the Iota Aquarids, a two-radiant shower having detectable meteors from July 15 to Aug. 25. At peak activity on Aug. 6, only about six members per hour are seen under good conditions; the radiants are at their highest point, about 40 degrees in the southern sky, at 2:30 a.m. local time. A waning gibbous moon halfway up in the east-northeast sky will interfere, to an extent, with viewing these meteors. The dramatic Perseid meteor shower is predicted to reach its peak this year on the morning of Aug. 13. The Perseids' radiant lies near the border of the constellations Perseus and Cassiopeia, not far from the famous Double Cluster in Perseus. It rises at dusk and is highest in the sky — nearly overhead — at 5:40 a.m. local time. When the Perseids' maximum occurs in a dark sky, as will be the case this year, this rich stream offers a crescendo averaging more than 50 meteors per hour, though double this rate has been seen on occasion. Many flaring meteors with trails are seen. The Perseids normally extend from July 17 through Aug. 24. The last summer shower is the Kappa Cygnids, which runs from Aug. 19 to Aug. 22 and peaks on Aug. 21. Though the maximum rate is only about four meteors per hour, this stream does provide slow-moving flaring fireballs, and a careful observer may be nicely rewarded for his or her time. The radiant is just north of the star Kappa Cygni and is nearly overhead — some 80 degrees up — at around 10 p.m. local time. During the peak, the crescent moon will be low in the west-southwest sky and will therefore offer little viewing interference.